Yellow vest protesters are turning out in small groups in Paris and elsewhere in France, even as momentum for their movement appears to be waning. A few dozen gathered Saturday on the elegant Champs-Elysees, scene of rioting earlier this month. Police are watching carefully, but both police and protesters appeared to be out in much smaller numbers than previous weekends. The demonstrations have targeted French President Emmanuel Macron, who ceded to several of their demands for tax relief and other economic help. However many people remain frustrated with his pro-business leadership and are continuing to stage roadblocks at roundabouts around the country. 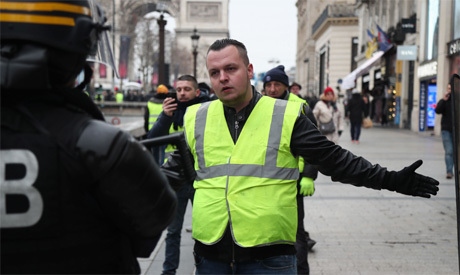 The movement began Nov. 17 as a protest over fuel taxes and is named after the fluorescent protective gear French motorists must keep in their cars.